When it comes to cutting boards, wooden ones outperform plastic and glass varieties in many areas. They halt the growth of bacteria, including those that can cause food poisoning, which means you have an extra line of defense in the kitchen. Not only that, wood cutting boards will not dull knives. Whereas plastic boards become knife-scarred in a short time, and glass ones require handling delicacy, wooden options will have no trouble taking average to heavy cutting and food preparation work. Plus, they often look great enough to serve as fashionable plates! Indeed there is much to be said in favor of cutting boards made of wood, but the products currently available in the market are not all created equal. Here is a detailed guide to make your shopping less of a headache. 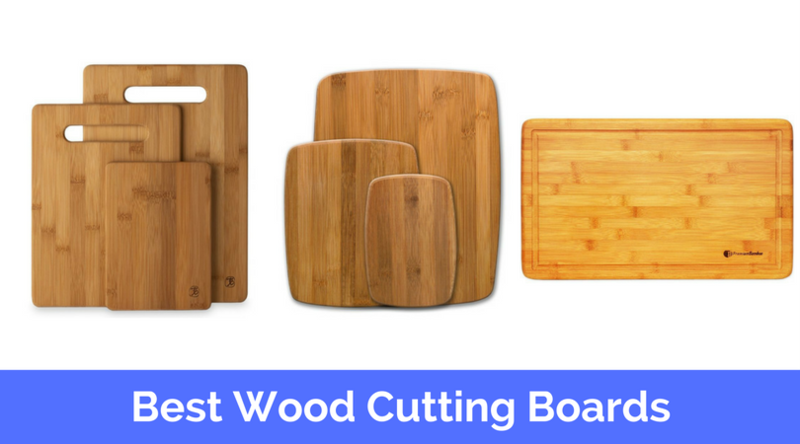 Choosing the best wood cutting board is a matter of determining the type that fits your needs the most. The thicker and denser the panels, the more suited they are for difficult kitchen jobs. You also have to consider your budget. Face and edge grains are more on the pocket-friendly side and will work great in regular household kitchens. End-grain boards are pricier but will be a great addition to any chef’s kitchen. Consider as well the type of wood. Great choices include bamboo, acacia, hard maple, cherry, and walnut. There is also the design to think about. Some come with feet while others are flat panels. It is ideal to avoid feet for thinner boards as this can lead to stability issues. Cutting boards come in different shapes and sizes too. Rectangular, circular, and square ones are quite common and can serve both utility and decorative functions. More creatively shaped options are available as well. Overall, have a good look at your kitchen’s needs and let this guide you in the buying process. To make things even simpler, here is a rundown of the top 10 best wood cutting boards worth looking into. Rectangular in shape with natural and contrasting patterns highlighting the beauty of Acacia wood. Top quality end grain wood that will hold up for a long time and will not dull knives. Fuss-free to clean and maintain – wash in warm soapy water and dry. Can be used for food preparation or as an elegant serving tray. 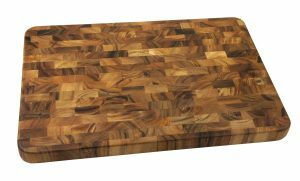 This end grain, acacia wood chopping block will satisfy beginner cooks and experienced chefs alike, making it an excellent addition to your kitchen. By using this board, you can do away with that annoying experience of whatever you are cutting slipping from your grasp. Food preparation becomes less of a chore and more of a delight. Weighing only at approximately eight pounds, this cutting board will not be too hard to move and clean, ensuring flexibility in the kitchen. It is designed well, with the contrasting natural patterns adding beauty and art to what is typically considered a utilitarian implement. Purchasing this means you will be the proud owner of a multi-functional board – a chopping block, prep station, and serving plate all in one. Durable for everyday use and big enough to fit average to large countertops. accidents will be lessened as well. Affordable for an end grain board and is multipurpose, giving value for your money. Resists wear and tear very well. Fresh out of the box, the product may come with an excess of glue from the crafting process. Quick sanding will remove this. If the board is constantly left with a wet bottom side, warping will occur. End-grain cutting boards are often pricey, but this acacia wood board is a top-of-the-line option that will not break the bank. It is highly durable and performs well in the kitchen, and it is beautiful to boot. 4 pieces of differently sized, two-toned chopping boards made with environmentally friendly and sustainable bamboo. Each piece is highly durable and lets you take advantage of the anti-bacterial properties of bamboo for safe and healthy food preparation. Will not dull your cutlery and provides a stable base for chopping small and large food items. Why just have one cutting board when you can have four to meet your needs! If you want something with outstanding value that will last a long time in your kitchen, these boards will not disappoint. Made of bamboo, they are highly durable and are stylish too. The best part is that since bamboo has anti-bacterial properties, you will have another layer of protection when preparing your food. Aside from all of that, these boards are quite sturdy and will not trouble you at all come cleaning time. The small one is great for more delicate cutting and chopping work, such as for trimmings and decorative purposes. The bigger boards, meanwhile, will do excellently for regular kitchen work, including chopping and cutting meat, fish, and larger vegetables. The boards have an indent running around near the perimeter, which is perfect for catching the liquids in case you are cutting juicy food items (tomatoes, lemons, pork, etc.). Stylish, two-toned color adds a touch of elegance and visual appeal on your kitchen counter. Food preparation versatility is guaranteed by the four differently sized boards. Some may find the boards a little rough right out of the box, but this doesn’t take away from their functionality. Minimalist but stylish, these bamboo cutting boards are great for any kitchen. Not only will you have highly functional chopping boards, you will enjoy their antibacterial properties for years to come. Rectangular cutting board with an indented design near its borders for no-mess food preparation. Made of 100% premium bamboo – eco-friendly and has natural anti-bacterial properties. Reversible and super easy clean so you can have a smoother time in the kitchen. Cutting boards are one of the most used tools in the kitchen, and so they must be durable, easy to clean, and functional. If you plan to stylishly serve food on these boards as well, then they must be visually appealing too. All of these qualities you can enjoy by taking home this Premium Organic Bamboo [HEIM CONCEPT] cutting board. Since this board is extra large and has a drip groove, preparing food will be less messy. Flip it over and you can use the reverse side as a pastry board. Overall, whether you are cutting up steak or trimming tomatoes for plating decoration, this board can handle everything. It will not dull or damage your knives as well. Best of all, it is made of bamboo, which naturally neutralizes bacteria from food. Enables safer handling of food due to its large size and anti-bacterial properties. Has a drip groove that minimizes liquid mess when cutting up juicy ingredients. The bamboo’s light and natural wooden color makes this board a stylish and beautiful kitchen implement. Highly durable and versatile enough for different cutting and chopping methods, and cleaning it is a breeze. The board’s large size can be disadvantageous if you are simply looking for a cutting board meant for medium or light food preparation. Can absorb the smell and flavor of a food and transfer it to the next ingredient you cut up. To remedy this, quickly wash the board in between cuttings if flavor transference becomes a concern. The chopping board can feel dry at times but regular oiling and maintenance should solve the issue. 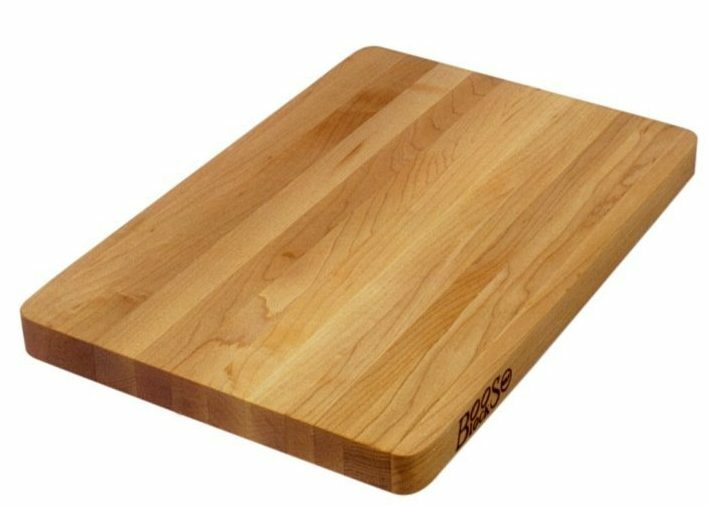 If you are looking for a wooden cutting board that will be flexible enough to handle a wide range of food preparation needs, then this board is for you. Made out of bamboo, it has anti-bacterial properties to improve food handling safety. Plus, it is highly durable and will look great on any kitchen counter, or on the dining table as a serving board. Created from Indian Sheesham wood, which is also known as the Indian Rosewood – the type of wood that is hard, dense, and has superior strength. Each board produced has a unique marble grain, so expect that what you will receive is one-of-a-kind. Easy to clean via quick washing, and naturally resists bacteria. Stable, non-slip, and durable – this cutting board will not disappoint. It is made of Indian Sheesham wood, one of the sturdiest wood out there, taken from sustainable forests. Since each tree is different, each board will also have a unique marble grain. This means you will have a special cutting board that will surely improve your food preparation process, as well as your countertop display. Sheesham wood is able to naturally resist bacteria, which is great since food cleanliness and safety are always a primary concern. Flexibility and stability are guaranteed as well through the boards large-enough dimensions and non-slip corner feet. When it comes to cleaning time, all you need to do is quickly wash this board and you are done. Dense and stable cutting board that makes regular to gourmet food preparation easy. Great to use as a serving board as well because of each board’s unique marble grain. The bottom gripper pads do a great job at holding the board in place, whether you are chopping large ingredients or cutting stuff delicately. Due to the uniqueness of the grain, no two boards are the same. But this could also mean that you get one that isn’t exactly your style. It requires regular maintenance, otherwise the cutting board can have small cracks on its surface. The Architec Gripperwood Gourmet Sheesham Cutting Board is one gorgeous piece of kitchen tool. Not only can you cut and chop on it, you can also use it as a serving board for a beautifully presented gourmet meal. It is highly stable and durable, and will meet your widely varied cutting board needs. Made of green Acacia premium wood, which is highly durable, water resistant, and can last the test of time. Double-sided – one side has a drip groove for no-mess food preparation. The reverse side is smooth and flat for gentler chopping work. Provides stability and will keep your knife blades sharp. Get a small cutting board and it may not be enough to handle most of your cutting needs in the kitchen. Buy a too large one and you will end up with a bulky board that might be difficult to work on. 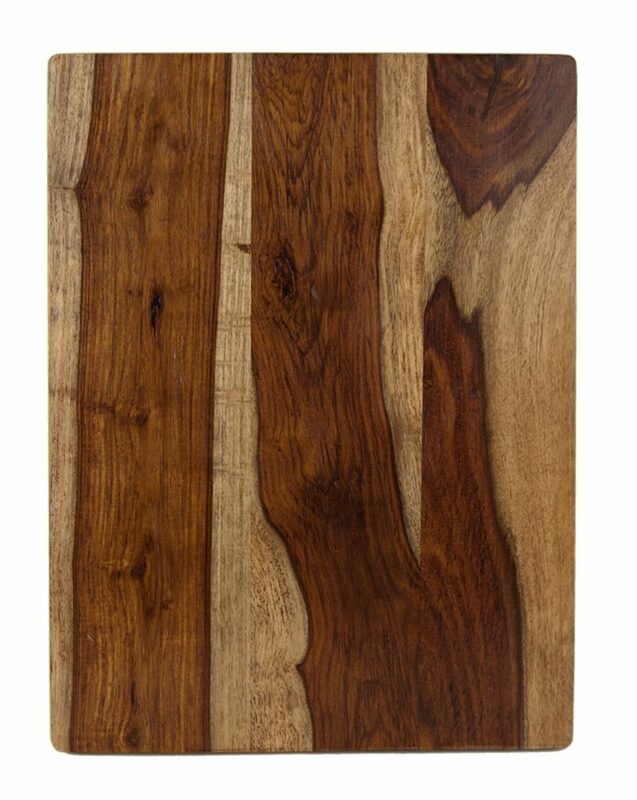 With this Acacia wood chopping board, however, you don’t have to worry about all of that. It is aptly sized, at 15 3/4″ x 11 3/4″ x 3/4″ and it is stable enough to afford you flexibility. It provides even more versatility through its multipurpose design – one side has a groove to catch drips and ingredient juices, while the other side is smooth and is perfect for more delicate cutting work. It looks beautiful no matter where you place it, and that is why many users use it as a serving board as well. 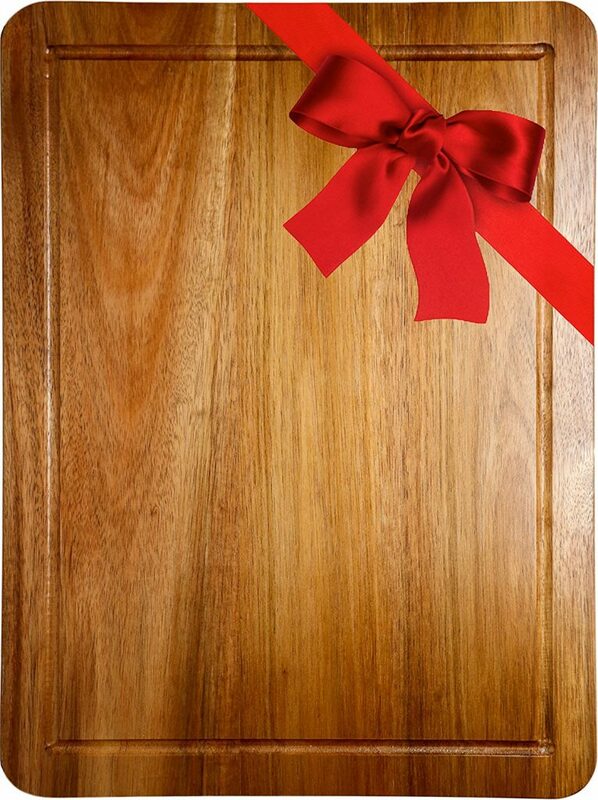 Since it is made of acacia wood, you can rest assured that this board will last a long time. Certified food-grade cutting board with anti-microbial properties ensuring hygienic food preparation. Can last for years without losing its pleasant aesthetics and stability. Multipurpose so you don’t have to worry about using this chopping board for all kinds of cutting and chopping techniques. It can even function as a beautiful and avant-garde serving plate. Some users find the side grooves rough and could use better sanding. Needs to be properly cleaned and regularly maintained or the wood could warp. This cutting board is highly stable and durable, beautiful to look at, definitely flexible for various kitchen needs, and nullifies microbes. Really, what’s not to like? This end-grain cutting board, made of dark acacia wood, is bound to stand out. It has a length of 19″, a width of 13″, and a thickness of 1.5″. It is large and thick enough to handle most of your cutting and chopping requirements. Has a reversible design, with one side equipped with a juice groove. Solid, durable, and stable. Will not take away from the sharpness of your blades over time. 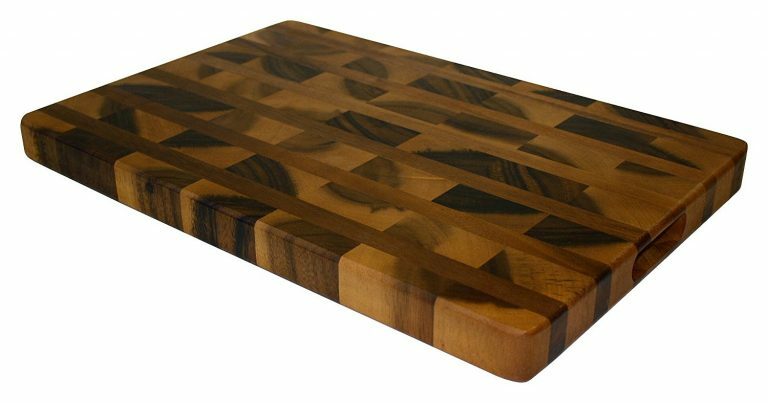 This cutting board is a first-class product made from dark acacia wood, from one of Asia’s largest wood plantations. It is made with care by experts with more than half a century of knowledge and expertise in crafting gourmet kitchenware. By owning this, you will have a wooden chopping board that is hard to beat. Its size and thickness are more than appropriate for a wide variety of cutting and chopping activities. Whether you are fileting a fish or slicing a watermelon, this board will serve your purposes with finesse. It is stable enough so you don’t have to worry about sliding and slipping. To top all of that off, this board is simply beautiful, exactly what you would expect from master craftsmen. End-grain cutting boards are premium choices, and this one is no different. Expect a high-quality product! Well-made and lightweight for its size, making it even more versatile in the kitchen. The overlapping patterns on its surface increase its visual appeal, so don’t hesitate to have this board on display on your countertop. Will not slip nor slide, and has a pretty solid feel ideal for heavy cutting and chopping work. Will require maintenance and conditioning to avoid drying out and cracking. Bees wax is great for cleaning and keeping this particular wooden cutting board in top shape. When not cared for properly, the wood could split at the seams. If you believe that cooking is an art and want a cutting board that feels amazing when you chop or cut something on it, then this acacia, end-gran product is a brilliant choice. Rest assured that this board will last for years, making it an excellent kitchen investment. This is a set containing three pieces of cutting boards made from top-notch bamboo. Has a curved-edge and minimalist design, making it look like a really stylish chopping board or a contemporary zen serving plate. Will go easy on your knife blades and provides flexibility in the kitchen. Whether you are fond of cooking all kinds of meat, making vegetable salads, or preparing fruity desserts – these bamboo cutting boards will rise to every occasion. In fact, you can even use them as serving plates since they have a stylish design perfect for visually pleasing breakfasts, lunches, and dinners. What is really great about this product is that it is a set of three. You will have a small board for lighter cutting and you will have a large one for chopping sizeable ingredients. Of course, there will always be the mid-sized board to bridge any gap in size requirements. 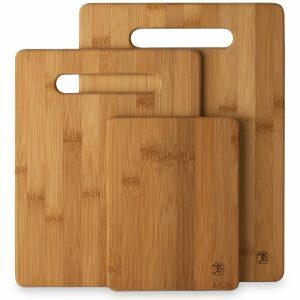 And, on top of all that, these cutting boards are made of durable bamboo with the ability to neutralize microbes! Reversible design so you can prepare meats, chop vegetables, or trim garnishes without much trouble. Made of bamboo, one of the most sustainable wood type in the world. That makes this product very environmentally friendly. 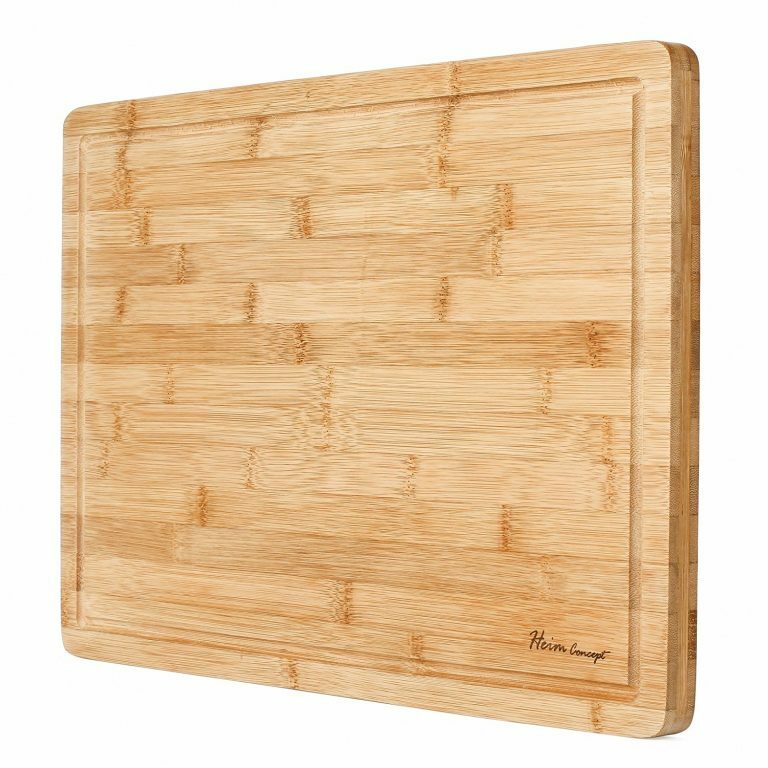 Bamboo is anti-bacterial, so this board will definitely help you prepare cleaner and safer meals. A few people who bought this product observed that the boards can be a bit rough. Sanding and oiling will smoothen it out easily. Constant washing may lead to delaminating of the veneer or splitting. If you are after a great deal, then this product—with its three boards for an affordable price—is definitely wallet-friendly! The best part is that you will own high-quality cutting boards that are not only solid and stable, but lovely as well. This cutting board is made from Maple wood, which is one of the hardest wood species in the world. Its creamy white and reddish tinge are made more beautiful by the natural oil finish. Both flat surfaces of this board can be used to slice and chop your ingredients. This cutting board will not be hard on knives and will prohibit the accumulation of bacteria. The John Boos Chop-N-Slice certainly deserves the top third spot on this list. Not only is it visually appealing, it delivers on its promises too! Made of maple, this cutting board will easily endure heavy cutting and chopping. Of course, it handles delicate and precise cutting and mincing too. Just like the others on this list, this board is also very good at going easy on kitchen knives. It is thick enough to give you that solid feel, and you don’t have to worry about stability. Since it has a reversible design, it doesn’t matter which flat surface you use. Come cleaning time, simply give this board a quick hand washing and you’re good to go. It is highly reliable and will be a great partner for you when it is time to slice and dice those meats and vegetables. Since it has a reversible design, it won’t matter which flat surface you use to cut up your food. That right there gives you flexibility during food preparation. It is rectangular and thick, with slightly curved edges. It is one beautiful chopping board. Because it is made of maple wood, you can be sure that this board will last a long, long time. Cleaning is easy via handwashing but this will need regular oiling to prevent drying up and cracking. The board needs to be taken care of properly or splitting and warping might occur. Looking for a substantial wooden cutting board to handle all of the rigors in your kitchen? By owning the John Boos Chop-N-Slice, you will have nothing to worry about. It is sturdy and highly effective. Definitely worth the money. Made of bamboo that is thick and very effective in combating the bacteria in ingredients. It measures 18 inches by 12 inches, large enough for big cutting jobs such as carving roasts and chopping a huge steak. Has a drip groove design to catch all of those juices leaking from the food you are preparing. Pleasing to the eyes with its light natural bamboo color. Need a cutting board that will let you carve roasts or trim small vegetables without you breaking stride? Then this extra large product by Premium Bamboo is a must-have. With its 18×12 inches measurement, you will have a reliable board for all of the dicing, mincing, and chopping that you need to do. Since this board is made of bamboo, it is quite resilient as well. Plus, it does not harbor bacteria, which ensures the safety of the food you prepare. To give you that extra convenience, it has a drip groove design that will take the mess out of food preparation. And with its natural light wooden hue, you will have a pretty cutting board on your countertop! Preparing food won’t be so messy anymore when you use this board equipped with a drip groove. 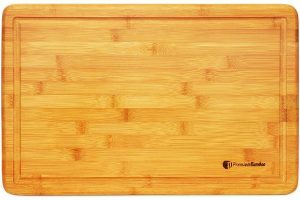 Because this is made of high-quality bamboo, expect that you will have a long-lasting and durable cutting board. Sanitation in the kitchen is improved by the anti-bacterial quality of this cutting board. Very easy to clean and maintain, and is not prone to splitting and warping. Pretty enough to be used as a serving platter, making dinners more sophisticated. Some buyers observed a strong chemical smell upon retrieving this product from its packaging. However, this is most likely due to the packaging materials used and not caused by the board itself. Thorough cleaning before usage is recommended to get rid of the odor. This board has loads of positive things going for it. It is naturally antimicrobial, won’t dull knives and other kitchen cutlery, and will make chopping and cutting a breeze. Plus, it looks chic enough to be used as a serving plate! 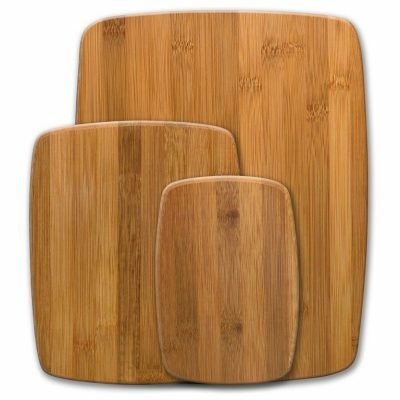 Three pieces of cutting boards created with care and precision from highly durable and naturally anti-microbial Moso bamboo. Strong and stable to prevent accidental slips when cutting, and will not dull your knives at all. Cleaning this board is no problem since you only have to wash it with water and soap. 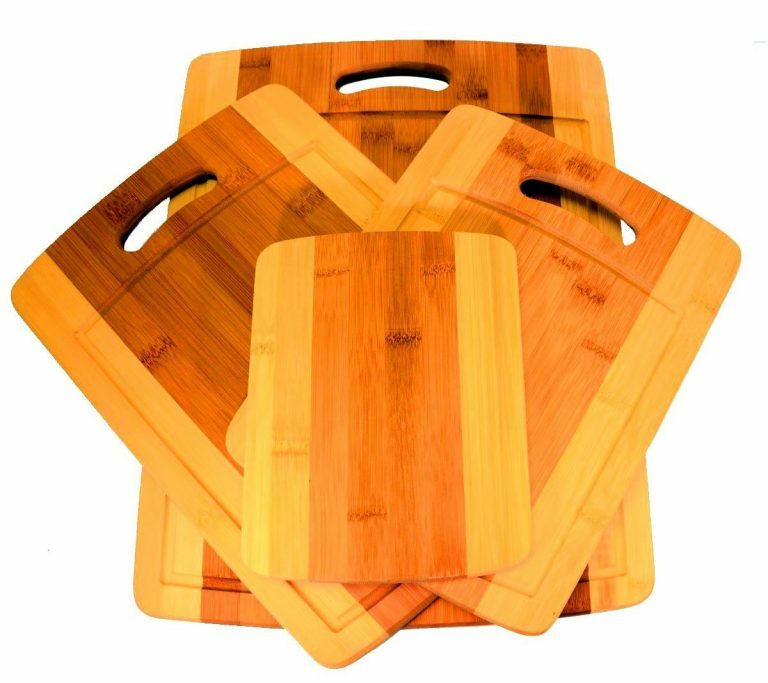 The top spot goes to this 3-piece bamboo cutting board set simply because each board excels at what they are made for, without considerably denting your budget. The boards are made of Moso bamboo, a species highly prized for its density and strength. Although not as thick as heavy-duty chopping blocks, these cutting boards will stand the test of time. If you need a board to cut large ingredients, the 9 ½” by 13″ will be of great help. Want a board for regular home cooking or maybe to double up as a stylish and contemporary serving plate? The 8 ½” by 11″ board is perfect for the job. How about for trimming fruits and vegetables or mincing garnishes? The 6″ by 8″ will not disappoint. And you can also use all three to serve breads, cheeses, and cocktail fare to guests! The three differently sized boards give you the flexibility and freedom to create classic meals and experiment with new dishes. These boards are not only great for preparing meats and vegetables, they can be used to serve bread, and crackers and cheese. They are even designed to function as a cocktail bar board. Because they are easy to maintain, you will cut down the time you spend cleaning up after food preparation and meals. The boards will need oiling from time to time to prevent them from cracking or warping. This set is highly versatile and, best of all, excellently prized. These three pieces of sturdy, non-slip, beautiful, and anti-bacterial cutting boards will definitely give you the best bang for your buck! Wooden cutting boards are certainly a great choice. However, if for one reason or another, a wood board does not cut it in your kitchen, here are your other options.